Curtis Pride officially became Gallaudet University's Head Baseball Coach on December 1, 2008, and began his work with an immediate advantage: everyone in the Deaf community already knew who he was, and many knew the details of his 23-year professional career, including 11 years in the majors and 12 in the minors. He played for the Montreal Expos. Detroit Tigers, Boston Red Sox, Atlanta Braves, New York Yankees, and Anaheim/Los Angeles Angels. Despite his prowess as an outfielder, was used primarily as a pinch-hitter and injury replacement. Still, he acquired a huge, devoted fan following, including a large contingent of deaf children and adults—hearing, too. He earned the respect of his teammates. It's well-known that Pride had an oral/mainstreamed upbringing. 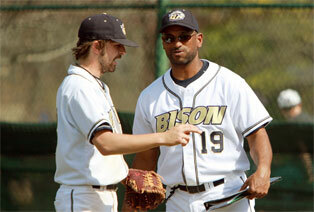 His appointment as Bison's Head Coach signaled Pride's entry into an American Sign Language environment, a task that he has been taking on with his customary determination. He was assigned interpreters, and began taking ASL classes so that he could communicate with everyone on campus—an act that could only enhance his popularity there. The Bison's home field was officially renamed in honor of the Deaf major-leaguer, William Ellsworth "Dummy" Hoy (1862-1961), in April 2000. It's known that Hoy, during his first stint with the Washington Senators (1888-1889), visited Kendall Green several times, was impressed with its beauty. We haven't found explicit confirmation that he participated in pick-up games with the students, but it's certainly possible. Ironically, Hoy Field is one of the very few diamonds familiar to Hoy that still exist. Despite their rich history, the Bison have not been known as a top team. The caliber of play tended to be casual—they played for fun—and got trounced by other collegiate teams that took a more aggressive approach to competition. Pride has taught his players how to grip a ball properly, how to do more aggressive baserunning, how to become more hustling, intuitive, serious players—competitors who play to win. Pride has acquired experience and savvy during his professional career, and wants the Bison to be top contenders. On April 1, the Bison ended a 13-year losing streak in the Capital Athletic Conference, defeating Stevenson University 5-3 in the first game of a doubleheader. Stevenson won the second game 3-2, but for the Bison, it was cause for celebration. The final game of the season, April 27, was a "heartbreaker" loss to Valley Forge Christian College. The Bison finished the season with a 4-34 record. "Yes," Proide told us, "the team's performance has improved since I took over the coaching position, but we still have a long way to go to be one of the most respected baseball programs." Pride knows what it means to win respect—the hard way. He's determined that the Bisons are going to have it too. Next Fall marks the Bison's debut in the North Eastern Athletic Conference—and a new chapter in the Bison's history.